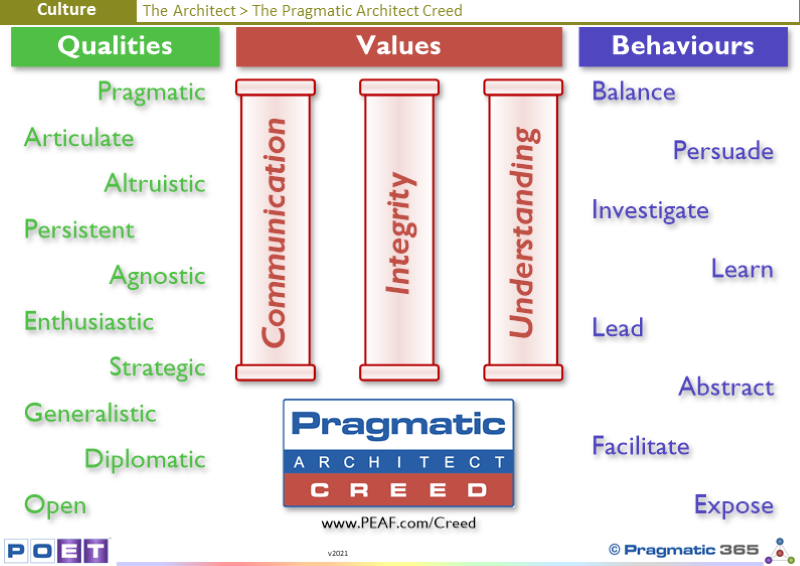 The Pragmatic Architect Creed (PAC) is a set of values, qualities and behaviours that an Architect in any domain should abide by. It effectively defines the culture of a Pragmatic Architect. If a Pragmatic Architect is asked to do something which conflicts with the Creed, or is aware that another Pragmatic Architect is acting in conflict with the values, he or she should raise a concern within their own department. Their department should investigate their concern. If the Pragmatic Architect remains dissatisfied following the outcome of the investigation, they may bring a complaint to the Pragmatic Architect Commission. In some cases, the Commission may also hear a complaint direct. ¨ Communication – Recognising that open, honest and direct communication is key to both understanding and being understood. ¨ Integrity – Recognising that being a trusted advisor is key to being believed by our clients. ¨ Understanding – Recognising that understanding client’s minds and getting clients to understand our mind is the backbone of what we do. For each of these values, there are statements that a Pragmatic Architect should be able to recite, with their hand on their heart. ¨ I believe that communication is crucially important as an architect. ¨ I believe that communication is key to me understanding other people and getting others to understand me. ¨ I believe that without good communication, no relationship can survive or thrive. ¨ I evangelise the value of Architecture and its benefits. ¨ I strive to create a "safe environment" where people are free to express their views without fear of punishment or recrimination. ¨ I relate new things that people do not know to things that people already know. ¨ I can vehemently agree with someone about subject/point “A” when I have only recently vehemently disagreed with the same person about subject/point “B”. ¨ I commit whatever time is required to explain and convince others when I am right. ¨ I can always explain the reasoning behind my views. ¨ I can clearly communicate contextual, conceptual, logical and complex issues and trade-offs to any audience. ¨ I am comfortable talking and presenting to large groups or individuals at any level. ¨ I believe that integrity is crucially important as an architect. ¨ I believe that an architect’s biggest asset is the trust he is afforded by the people he works for and the people he works with. ¨ I believe that without trust, no relationship can survive or thrive. ¨ I ensure the interests of the Enterprise as a whole are addressed even if they appear to conflict with immediate management. ¨ I stand up and give an unpalatable truth when no one else will, even though it may mean I lose my job. ¨ I will seek to terminate a consulting engagement early if it transpires that the customer can get no or little value by continuing. ¨ I always tell the truth. ¨ I never hide or disguise things. ¨ I tell clients what they need to hear, not what they want to hear. ¨ I welcome being proved wrong and if I am, admit it as soon as possible. ¨ I suggest only appropriate solutions - even if that is a 'pen and paper solution'. ¨ I believe that understanding is crucially important as an architect. ¨ I believe that if we do not understand something, people cannot form opinions or solutions to problems. ¨ I believe that without understanding, no relationship can survive or thrive. ¨ I believe that the primary responsibility of an architect is to enable informed decision making. ¨ I believe that the most important question to ask is - Why? ¨ I see patterns and structure in everything from traffic congestion to Pop music and flowers. ¨ I spend more time understanding a problem domain than determining a solution. ¨ I spend more time asking questions and listening than I do talking. ¨ I can see disagreement between people when those people think they are in agreement and vice versa. ¨ I can abstract anything or idea to a logical and conceptual level. ¨ I constantly self-analyse what I do and how I do it to determine how to improve myself and my work. ¨ I know the difference between Architecture & Engineering. ¨ I know the difference between types of abstraction (Omission/Inclusion, Composition/Decomposition, Generalisation/Specialisation, Idealisation/Realisation) and when and how to use them effectively. ¨ I know the difference between types of Idealisation/Realisation (Contextual, Conceptual, Logical, Physical, Operational) and when and how to use them effectively. ¨ I know the difference between a model, a meta-model, and meta-meta-model. They are always looking to understand what the perfect solution can be but tempering that with a more commercial and tactical view that relates to the realities of getting things done. Architects need to be able to see the long term perfect solution but they need to be able to temper that unattainable goal with the tactics of getting things done. They are at home communicating with everyone from the board to the graduate programmer or claims clerk and in scales from one to one to speaking to hundreds at conferences. Communication is a major part of an Architects role. Being able to listen, ask the right questions, and explain things in words that people can understand from CEOs to the tea lady. They are selfless, and always focused on what is best for the Enterprise not what is best for them. Architects are 100% focused on the Enterprise they work for. Even if this means losing their own job. They will not be steamrollered and will stand up for what they believe in. A good idea or a worthy point that needs to be made for the benefit of the Enterprise, needs to be made regardless of an environment that may not let that happen. They see all things from Supercomputers to paper, pencils and people as possible solutions to business problems and will propose the most appropriate for any given context not what their favourite is. Architecture is all about providing business value, not about and Architect’s “favourite” things. They are passionate and enthusiastic about what they do and how they do it. Enthusiasm is an inspiring trait and Architects need to inspire others in order to affect and guide the culture of an Enterprise. They are focused on long term and lasting benefits rather than short term benefits which compromise long term objectives. Long term and lasting benefits are more important strategically to an Enterprise. They have a broad base of technical and business experience. Architects deal with breadth rather than depth, and therefore need a broad range of business and technical skills. They are sensitive to other people’s drivers and the political context. Architecture is more to do with people and culture than anything else. Architects therefore need to be able to discuss often difficult and controversial subjects and truths with tact and sensitivity. They are open to critique, happy to be proved wrong, and will assimilate and apply new information as it arises. Architects do not have all the answers. They need to be open to criticisms and open to adjusting their views as new information is exposed or the environment changes. The problems Architects solve are “wicked problems”. Such problems do not have simple answers. Indeed, the questions they answer are also not simple. They persuade others of their views and the way forward rather than dictating. Architects rely on others to achieve their aims and as such people must be persuaded of an approach. When people buy into an idea or approach they are much happier and much more productive. They have a nose to seek out things that don’t make sense or could pose threats and risks, and the ability to get to the bottom of them. Things that don’t make sense are usually problems or opportunities. Either way, Architects need to be able to dig into things where necessary to expose them so that they can be addressed. They pick up and assimilate new information quickly and easily and are always open to new ideas, businesses, technologies and processes. Business and the world is an ever-changing place. New things are happening all the time and Architects need to quickly understand them and how they impact the business. They lead, motivate, inspire and enable others to reach their potential and create the environment where people want to follow them. Architecture is all about culture, and therefore to adopt and make the cultural changes required, Architects need to be able to take individuals and the Enterprise on a journey and that journey must be by mutual consent not by dictation. They abstract levels of detail to higher levels to aid understanding and to see hidden relationships and patterns. Architecture is a lot about seeing structure and patterns. In order to do this an Architect needs to be able to see and synthesise these higher-level structures from underlying information that can be very detailed and/or incomplete. They guide discussions and workshops in order to get the best out of people. Architecture is a lot about communication and also about liberating information from others. It is also important to be able to guide discussions and to bring people together where there is agreement and to facilitate valued discussed where there are differences. They seek to expose pertinent information to business leaders to enable them to make more informed decisions. Decisions will get made regardless of whether full and/or pertinent facts are known. Architecture is all about making sure people who make decisions are fully aware of the risks, issues and implications before the decision is made. Would these Qualities and Behaviours be beneficial to your Enterprise? If so, in what parts of your Enterprise and in what roles? what happens to people who exhibit these Qualities and Behaviours in your Enterprise? If not, which Qualities and Behaviours do you actively look for? Will you sign the Creed?